Nearly every consumer device makes use of the Light Emitting Diode (LED). This highly versatile device offers an easy way to add an indicator to any project while drawing a relatively small amount of current. Once their operation is understood, adding them to any project is a simple task. This tutorial is a simplified explanation of how a LED works and how to select a current limiting resistor. The LED tutorial here is enough to use LEDs in a project but is not intended to be a thorough explanation. A Diode is an electronic component that only conducts electricity in one direction. The “Forward Voltage” rating of a diode will determine the minimum voltage difference between the anode and cathode to allow current to flow. For example, let’s consider a diode with a forward voltage of 0.7 volts. If you apply +1 votls to the anode and 0 volts to the cathode, then current will flow. However, reversing the voltages to apply 0 volts to the anode and +1V to the cathode, prevents current from flowing! A “Light Emitting Diode” (LED) is a variant of the standard diode with the same characteristics. The obvious difference is that when current flows through an LED it generates visible (non-visible) light. The forward voltage defines the amount of voltage required for the current to flow through the diode junction. Any voltages below this level cause the LED to remain “open” or non-conductive. This open state also means any components in series with the LED will not have current flowing through them either! Current is allowed to flow through the LED once the voltage drop across it reaches the forward voltage. Not only that, but the LED only drop its forward voltage at any given time. This point is what makes a diode or LED different from a resistor. A resistor is called a linear device because the current that runs through it is directly propertional to the voltage applied and its resistance. (You might know this as Ohm’s Law.) A diode or LED is different. Voltage and current has a non-linear relationship. Now let’s look at a pratical example. Consider a LED with a forward voltage rated at 3.0 volts. What happens if you attach the anode to the positive (+) terminal of a AA (LR-6) battery and the cathode to the negative (-) terminal? Will the LED do anything? No! The AA (LR-6) battery only has a nominal voltage of 1.5 volts. Until you add a second battery, the LED will not light up. So if you use two nominal AA (LR-6) batteries in series and connect them to this diode, it will light up, and all is good, right? Well, No. Inside the LED, that the diode junction turns into a (near) short-circuit when the a forward voltage is applied. This behavior means the LED could draw ALL the current it can from the battery. This situation is not good because you are short-circuiting the battery! Not only will this damage the battery, but will overheat or destroy the LED! As mentioned before, applying the forward voltage turns an LED into a short cirucit. As a short, the LED will draw all the current the supply allows AND will damage itself. So you must limit the amount of forward current allowed to flow through the LED. There is where the name “current limiting resistor” comes in. A resistor placed in series with the LED limits the current that flows through it. Diodes, and LEDs, drop a constant voltage regardless of the current that runs through them. So the Resistor and LED work together. The resistor holds the amount of current constant and the LED holds the voltage dropped across each constant. The next question to address is, what value resistor is needed? The goal is to set the Forward Current for the LED at 20mA which means the LED will drop 1.8-2.2V. In this case, make the assumption THIS LED is going to drop 2V. A common misunderstanding is how the forward current is specified. 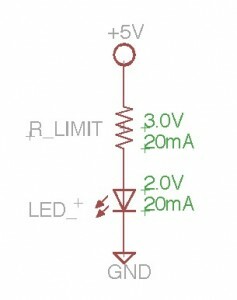 The LED’s datasheet provides the maximum forward current the LED can handle. In most cases, that current is 20 mA. Operating the LED at this maximum will give a shorter opertional lifetime. Also, it operates the LED at its brightest. If you just need an indicator light, consider a much smaller value like 5 mA or even 1 mA. Ohm’s law determines the value of R_LIMIT. The R_LIMIT and LED are in series. This connection means their voltages add-up and the amount of current going through them is the same. The LED drops 2 volts across itself, leaving 3 volts for the drop across R_LIMIT. Since these two components are in series, 20mA of current will flow through both. Ohm’s Law says that Resistance = Voltage / Current. This means R_LIMIT = 3.0V / 20mA = 150Ω. The resistor value used depends on which LED is picked. Generally it will be in the range 150-470 Ω. When in doubt, select a slightly large resistance value. Diodes are simple, yet versatile components. LEDs extend these properties to include lights. LEDs have plenty of cool Matrix-based projects as well as more practical uses like status indicators. The information shown here shows how to find the Forward Voltage and Forward Current of an LED from its datasheet. Then Ohm’s Law is shown to calculate the correct limiting resistor. This AddOhms video on LEDs and Current Limiting Resistors might be of interest. You can see what happens when you don’t limit the current! Do you have a question that was not covered here? Leave it below. Thanks mate. This critically helps me a lot. I just have a question. I’m using the 10W LED (forward voltage Vf=9-11V and the forward current If=1000mA) and the 9V battery for power supply. Do I need to add a resistor in series with my LED? And another strange question, if I connect that LED directly to the 9V battery, will it burn my LED? Because I don’t know how much current the 9V battery will pour into my LED without the resistor. Thanks for your help. High power LED modules like that are meant to be driven by a constant current supply. 1 amp through a current limiting resistor would waste a ton of power. And yes, you need to do something to limit the current. When you say 9V battery, I really (really) hope you don’t mean a small rectangular style. They barely provide 25 mA. 20mA is generally the absolute maximum (depends on the particular LED) – so you should design for less current than that to be safe. Glad you made a comment. This tutorial is in need of some serious touch-up. Thanks. Hi! Thank you for the information! I do have a questoon. What do I need to do if I want to simultaneously light multiple diodes at once? Put them in parallel. If they are on constantly, you could get away with a single resistor or constant current supply. A better approach is to limit each parallel string individually. current. it is confusing for a novice. my led is going to drain it ? or battery is going to push as much as it can? in case i have 2 adapters, same voltage but different A i have idea they push into the ‘system’ the declared A? in some explanation i found the system is draining the current it neads and from that depends battery longevity which does not make a lot of sense if the battery is pushing current. with one led seams ok but if you have more complex system? sorry if my question is confusing i am dyslexic which complicate the explaining myself. You are mixing up terms which is what causes the confusion. In a circuit, current flows in a loop, or a chain. It is not the case that the battery or power supply is “providing” electrons. Instead, they push the chain of electrons around the circuit. The amount of pressure put on that chain to move is the voltage. The load, or devices in the circuit, determine both of those factors. Most power supplies are designed to be “constant voltage” which means they old a voltage at a certain value. The amount of current flow depends on the circuit. This is the basis of Ohm’s Law. A resistor with a certain voltage applied will cause a linear amount of current to flow through it, based on its resistance. So this means, the devices determine how much “current” flows out of the supply, up to the supply’s maximum. Now when you start getting into other devices like capacitors, diodes, and ICs, Ohm’s Law still applies but the analysis isn’t as simple. You want to read and watch my tutorials on current flow. #1) If I have a current-limiting ‘ballast’ that is rated at 530 mA, does it matter what the maximum forward current through LEDs in the circuit is? #2) Also, if the circuit closing Voltage of the LEDs has a range of a few volts, which I assume is a tolerance not a range of operating voltages, can I reasonably expect that they will ALL light, if I do not exceed in total the nominal line voltage? For example if I use 3 LEDs with a forward voltage described as: 36.5 typical, 38.0 maximum, and I am using 110V house current, do I run the risk of aberrations, if I happen to receive 3 LEDs with a 38.0 V forward voltage requirement? #2 b) Can I assume that I have a full 110V available for use after the power is conditioned by: a 120-277V LED Electronic Driver (specifically: a Philips Xitanium, LED-INTA-0530C-280-DO), and a Driver Transient Immunity Device (Thomas Research, BSP3-277-LC). Thanks in advance for any enlightenment. This tutorial was not meant to take into account high-power LEDs used in mains/AC applications. I’m not sure what “ballast” means in this context. The maximum forward current always matters. Can I use LEDs with a maximum forward current of say, 1200 mA without loss of performance of the array as compared to using LEDs with forward current limitations of say 540 or 650 mA? Maximum means maximum. Not minimum. It isn’t necessary to drive LEDs at their maximum forward current. Operating lower than max means longer lifetime, but less bright. Yes. LEDs are not intended to be connected directly to AC mains. You would need a driver/inverter. … I will at least say, no, you would NOT use just resistors in this situation. The power rating required and heat they generate would be absurd. Beyond that, I cannot comment. 480 volt is not something to play with. Sorry if I have misused the tutorial, just trying to determine how to modify some commercially available LED Lighting fixtures to improve the effectiveness in terms of the parameters of my needs without sacrificing performance, reliability, or lifetime of the fixtures. When I reviewed the specs of the LED drivers, and LEDs themselves, I concluded that I was safe in using materials made by the same manufacturers as the equipment originally used, if I hope to achieve the same sort of 100,000+ hour lifetime as the original fixture. Also, the LED driver (sorry for the earlier use of the word ‘ballast’ – laziness on my part) has a footprint that the fixture seems to incorporate by design, and I am loathe to create adapters to accommodate other manufacturers’ Driver footprints unless that becomes necessary. As the original Driver maker seems to have no Drivers at greater that 530mA (at least under that product group name) I am initially persuaded to try to work within the 530mA constraint. I started out thinking that I would replace a series of 4000K light temperature LEDs, with 5000K LEDs because the 4000K units provide light that lacks sufficient unpleasantness to deter inebriated passersby. However the LED manufacturer (Nichia, I believe) seems not to now make LEDs of the same physical dimensions as those used originally. This led me to examine other possible solutions such as larger LED footprint (although I am constrained by the size of the opening in the parabolic focusing reflector), and higher light output levels. Enter the operating voltage: I have tried to assume that household current nominally 110-120V is best predicted at 110V, and thus that I can expect to have only 110 Volts to work with. Is this truly the amount of voltage that I have “at the first LED” or should I expect a lesser voltage due to the signal conditioning components (Xitanium LED Driver, Driver Transient Immunity Device). As you have noted (Thank You!) a reduction in the driving current will diminish the brightness of the LEDs. Is there a way for me to estimate the reduction in light emission relative to driving Current? If there is either an equation or a plot online that can be applied in general, can you point me toward it? This would help me understand both the effect of the parallel wiring pattern I might choose to use, and the advisability of using LEDs of much higher current tolerance (up to 1800 mA). My goal is the generation of the high luminous flux, at 5000K or greater light temperature. Thank you for your help, and I apologize for the inexactness of my earlier comments. I can see that my descriptions were the cause of any confusion in addressing them. Please understand that anything you say in response to my questions, is information for which I bear the full responsibility in its interpretation and/or application. At no time, and in no way does it create a potential liability for you, in my use of the information. I think you have a lot of research ahead of you before you should even think of approaching this. Thanks for this good info. A related question, can the forward voltage value of an LED be measured? As in, if you have a pile of LEDs and don’t know the specs. Oh, wait, never mind. I think you did just that in your video. In that section you don’t address the Reverse voltage in the least. Oops. Never realized I did that. I had no intention of addressing reverse voltage since it is no different from a regular diode. Fixed. Thanks. I really liked this presentation. It has a lot of the basic thinking about Ohm’s Law, plus the practical application in a circuit easy enough for a beginning student to “get.” BTW I also like your new website format. Keep it coming. Can you please tell the diffrence between Drive Voltage and Forward Voltage of LED? It’s a matter of context. Drive voltage is what the voltage of the source. The forward voltage is the forward voltage drop of the LED. So if you have a power supply (or driver) with a forward voltage of 1.6V and your supply can only provide a drive voltage of 0.7V, the LED won’t light. Although your explanation is useful, there are some gross inaccuracies. The LED is not a short circuit across a supply that exceeds the forward voltage. The LED does not draw all the current from the supply. An LED is a semiconductor diode and as such has a very non-linear I-V relationship. As you increase the supply voltage, the current through the LED increases exponentially. You can determine the current through calculation. However it is simpler to just draw a load line across the LED’s I-V characteristic curve. For most practical purposes, it is sufficient to use the forward voltage at almost any LED current since in most cases we simply just want to see the LED lit. I rarely operate an LED at the rated 20mA. For most cases 1-5mA is bright enough. I thought I left a reply earlier, but think it was on the wrong site! Thanks for your good explanations on LEDs, it’s a great help. I am trying to wire some specific wavelength LEDs but their Vf is 1.9-2.3. I have tried using AA and AAA batts on these and interestingly the AAA’s seem ok, but the AAs have burned out the LED twice. So 2.8 or so volts measured on the AAs apparently is too much voltage?? but based on your info on this video it’s really too much current adn I need a limiting resistor. If I use the calculator, specs on the LED are Vf 1.9-2.3; Iv 240,000 so guess that’s in mcd or something so it’s probably 240 mv?? that gives me a small ohm load of 2.2 ohms, sounds strange?? Wonder how they make them work in flashlights where they have 9 LEDs, all in parallel on 3 AAA batts?? AAs have a higher current capability compared to AAAs. The internal resistance of the AAAs were limiting the current for you. The AAs allowed more current to flow, burning them out. There should be a current specified for the desired wavelength, not a voltage. The forward voltage is 2.3V. If you’re using two AAs your nominal voltage is 1.5V for each cell, which will drop to about 1.3V as it dies. (Assuming Alkaline). So if using two AA batteries in series that’s 3V – 2.3V = 0.7V. So if that specified current was 20mA then you’d calculate: 0.7V / 20mA = 35ohms. ok, see how you calculate it, wasn’t using the voltage difference so undersand now . Still not sure why why those small flashlights work ok with 9 LEDs , guess it’s they use AAA batts and since they limit the current a bit, it’s no problem. Thanks for your response, very helpful as I try to navigate the vast LED sea ! of information out there. Thank you for your observation, but I had not perceived any negative connotation. Thanks again for the advice. Thank you James. No, the run time will not be for large durations. Still, you are saying that a couple pairs of “C” batteries in series with a resistor are better than a 9V, correct? Would D batteries be better still ? I am thinking of running 3 or 4 parallel runs of 3 LED’s wired in series. Of course Cs and Ds are going to run longer. In the old days, 9V batteries were 6 AAAA-sized (smaller than AAA) batteries in series. So imagine how long those would last! Even 6 AA batteries in series can provide a pretty significant run time. However, before you go calculating run time, you need to determine how many LEDs you are going to be using and how much current will end up being drawn. BTW, I just re-read my own comment. When I started “Of course…” I meant that in a matter-of-fact style, not a combative-duh style. Realized it could be read two different ways. I have been reading numerous forums as to the proper series-wiring of led’s, as I’m trying to construct hidden, yet bright illumination in a display area under a glass end-table. Just when I think I have the facts, I read that a resistor should be employed. If, for example, I wire three led’s in series that have a 3.0 forward-voltage rating to a 9V battery, isn’t it going to work properly per: ( 3 x 3.0 ) = 9 ? Now, to make it a bit trickier, what should I do if their rating is in a range of 3.2 – 3.6 and I still want to power it off a conventional 9V DC source? Does that mean I can run only two of those plus the prescribed resistor? If so, would you suggest hooking up two 9V batteries in series in order to run more lighting? I am not sure how many I’ll actually be needed for my project, as I may use either 3mm ones with 16,000 mcd luminosity rating or 5mm with a 35,000 mcd rating. Too bright ? First, I would absolutely not recommend using those small rectangular 9V batteries. They are only rated for 25mA and even then for only a few hours at most. Second, you’re right, you won’t want to run 3 LEDs with a forward voltage around 3V in series. The internal resistance of the battery will cause some current limit, but then you’re literally burning up the battery to make that happen. The forward voltages are rated as typical and the LED will conduct with less than the forward voltage applied, but it will be a non-linear difference. So you might need to test if less than the idea forward voltage will be bright enough. Make sure you test across any temperature range you expect the circuit to function. In lieu of trying a 9V source, what other compact D/C power source would you recommend ? I am trying to avoid using a corded A/C transformer. I am not sure how many of the 3 or 5mm LED’s will be needed, but I guess that the power source will determine my limits. You just need more than the LEDs themselves will drop. Not all LEDs have the exact same forward voltage, there is variance even within a batch. So if you calculate you need around 9.9v I’d suggest 12v. You can use batteries, you just won’t be able to use the small rectangular style. Unless you want a run time of a few minutes. Great explanation. Exactly what I was looking for. Thank you and please keep sharing the info. nice. Non engineer trying to learn electronics. I have a PhD in Chemistry and an MD, but no formal electronics training. Playing with arduino..
haha good sense of humor @baldadmin. and thank you for simple and informative post.